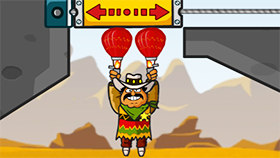 Amigo Pancho 7 is the 7th part of this fun puzzle series, developed by Qaibo Games. Welcome to the exciting series Amigo Pancho. Did you know that Pancho is an archaeologist? In this game you will help Pancho find the treasure inside an Egyptian pyramid. The game has 10 leves, with each level being a challenge for you. Do not forget to turn on the sound when playing the game to enjoy the interesting melody. In each level, you have to overcome various dangers, such as fire, spikes, strange creatures ... You must clear the sand to make way for Pancho, you must use the iron barrel as your shields, And you have to use rocks to stop the laser beams. Each time you complete a level, you will gain points and a valuable treasure. Note that each level has 3 medals, you can collect them after you finish the level. These lasers can kill Pancho, however, they can also kill strange creatures for you. Use lasers effectively to overcome difficult situations. I played Amigo Pancho 7 for hours because of its addictive gameplay. And I believe you will also like this game. Now, it's time for you to experience the game. Good luck and have fun! Use mouse to remove objects and help Pancho tìm các kho báu. Use the fan to help Pancho dodge dangerous obstacles. Timing is the key to completing the game. The amount of medals per level depends on your score. Amigo Pancho 7 Unblocked is a great game and you want to play it? Visit Freegames66 now. Here, you have a friendly interface and you can Amigo Pancho 7 Unblocked with just one click. In addition, freegames66 works 24/24 and all unblocked games here are free. Now, enter Amigo Pancho 7 Unblocked, click to remove the objects and help Pancho find the treasure. Play now!